This project shows how to make your Arduino act like a single 6-sided die using LEDs and a button. You have to bend the pins a little to place them. Don't bend them too much if they need to be used again for another project. Add 330 Ohm resistors connecting each of the shorter pins (negative) to GND on the breadboard. 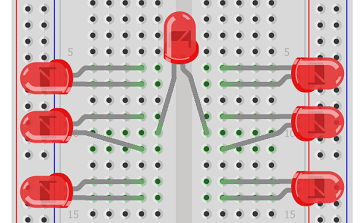 Connect a pushbutton up to another part of the breadboard (look at the LED pushbutton project to see how to do that). Use pin 8. Connect up the 5V and GND rails of the breadboard to the correct pins on the LED. All 7 LEDs should blink on and off. A Random Seed is set for the random number generator by reading the 'noise' from one of the unconnected pins. A showBinary function is adapted from one of the earlier projects to allow us to use a single byte to represent each pattern on the die. The roll() procedure cycles quickly through 20 different numbers and stops on the last one. This project takes up 8 pins. With a shift register, the code would be simpler and only 4 pins would be needed in total. Using a similar principle to this project, you could lay out a load of LEDs (say 12) in a 4x3 grid. If you treat each column of 4 LEDs as a 4-bit binary number, you could find an efficient way to write patterns to the grid. With 5 rows of 3, you can display digits quite reasonably.